Last Tuesday was C's birthday, and, at his request, we spent part of the afternoon visiting the George Caleb Bingham exhibit at the Museum of Art and Archaelogy on campus. Bingham was a nineteenth-century Missouri artist (and, for the last couple of years of his life, the University of Missouri's first professor of art), and C. studies the nineteenth century (including literature of the "old southwest," which included Missouri), so it was a natural fit. The exhibit was small, but C. was particularly interested in a piece called "Martial Law, or Order No. 11." The Missouri (slave state)-Kansas (free state) border was a major site of battles during the Civil War. 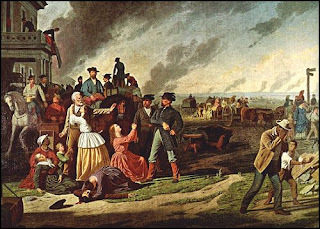 Missouri also harbored a number of guerrila groups (think Jesse James), and, after a massacre at Lawrence, Kansas, the Union suspected that rural Missouri towns along the border were harboring these groups. These towns were ordered to be evacuated, and that was Order No. 11. Although he was a Unionist, Bingham vehemently opposed this order and the havoc in wreaked on people's lives. This painting, then, was meant to protest the order. He sent it to have it copied onto a steel plate and reproduced. Unfortunately for his purposes, the copiest took a couple of years to finish the job, at which point the exigency for the protest had passed. I was intrigued, however, by this idea, something I hadn't really thought about before: the use of reproductions of paintings as distributed rhetoric. I wonder (in a light, curious sort of way) how prevalent that was. I think of "art" as maybe epideictic rhetoric (think: monuments), but I hadn't really thought of its use as part of a deliberative process or a distributed network.